The new Dacia Duster Estate is family friendly, price friendly – and remarkably desirable. We say remarkable because you can pick one of these up for less than £10,000. This is the petrol variant of the Duster, and while that means it costs more to run than the diesel, you can still return over 46mpg economy. If you’re prepared to spend extra on the range-topping model, Dacia will even throw in a few luxuries for you, such as a leather steering wheel and electric heated windows. Nice. If you’d like to find out more about Dacia’s history, from their start as a state-owned manufacturer to the present day, then read our article here. Join OSV as we take a closer look at what it’s all about in our review of the 2018 Dacia Duster Estate. If you’re an enthusiastic driver, you’ll want to look away now as this was never a car intended to be fun on the road. If you want a four-wheel-drive car that’s entertaining, we can point you in the direction of the MINI Countryman. Everyone else who needs a hassle-free but rugged and also predictable driving experience can read on. Body lean is a bit of an issue in bends, while vague and slow steering is one of the prime reasons the Duster’s driving experience is so underwhelming. Performance-wise, however, the car keeps up with its rivals well and Dacia have added a brand new petrol engine to the line-up. All models get an easy-to-use 6-speed manual gearbox that feels a bit jerky at first. Once you’re up to motorway speeds, it settles down. A 6-speed EDC automatic ‘box is available as an optional extra. We like it – it’s responsive and smooth – but it does hold onto gears for too long at times. In terms of the engines, the entry-level Access model comes with just the one engine, a 1.6-litre petrol unit that’s loud out on the motorway. However, since it’s also the most affordable Duster model, we reckon buyers will be prepared to overlook its deficiencies – of which there are one or two. For one thing, it makes a noise on the motorway, and for another, it needs you to push it hard to get the best out of it. It’s slow too, and takes 12.0 seconds to complete the 0-62 dash if you specify four-wheel-drive. Stick to two-wheel-drive and the engine can theoretically complete the sprint in 11.0 seconds. A 1.2-litre turbocharged petrol engine powers the range-topping model. It develops 123bhp and can haul the car from rest to 62mph in 10.2 seconds if you stick to two-wheel-drive, and 11.0 seconds if you specify four-wheel-drive. We’re not going to lie – there isn’t much going on inside the Duster where style is concerned. However, it was Dacia’s aim to make this car as spacious, accommodating and practical as possible. And to this end, they’ve succeeded. There have been a few revisions since last time, too. The upholstery for the seats is new, while satin chrome inserts and the dashboard finish brighten things up a bit. Material quality is still way off what its rivals are offering, though, and this is a bland cabin overall. The switchgear and dials are well-positioned and they’re easy to read and use, but a real lack of hi-tech features might put some buyers off. Still, you have to ask yourself what you expect for a car that costs less than £10,000, and while it isn’t easy on the eye, the cabin is user-friendly and built to last. 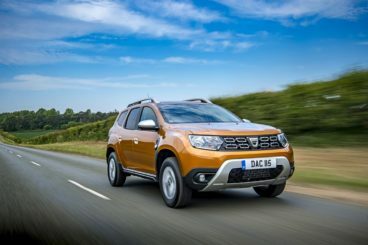 Is the Dacia Duster practical? It is. The driver sits up high, the square windows are nice and big, and this all makes for excellent visibility. Passengers all round are well accommodated, and head and legroom are good. Storage space is good too, and includes a large glovebox, while the boot measures 469-litres with all the seats up. That’s an impressive size, and if you fold the rear seats you can increase it to 1,101-litres. Standard kit is pretty spartan for the entry-level model. It’s only available with the smallest petrol engine and it misses out on a height adjustable driver’s seat, air conditioning or even a stereo. The Air model adds 16” alloys, a digital radio, Bluetooth, body coloured front and rear bumpers and a height adjustable driver’s seat. The Nav+ model threatens to take us into premium territory with upgraded upholstery, a leather steering wheel, rear parking sensors, electric heated windows and an economy computer. Safety-wise, Euro NCAP have twice awarded the Duster just 3/5 for its crash test performance, which is disappointing and a tad alarming. Its standard safety kit is limited and this may put some buyers off. Prices for the new car start out from £9,495 and rise to £18,395. For more information on our leasing deals, you can check out our page here. In terms of its running costs, how economical you think it is depends on what kind of car you see it as. If you view it as more of a supermini, it’s going to look a tad expensive. If you see it as more of an out-and-out Estate car, its running costs will look pretty good. OSV? We think its costs are decent, but a lot of its rivals are cheaper to run. The 1.6-litre SCe 115 petrol engine returns 44.1mpg at best and emits 145g/km of CO2. Not fantastic, and if you add four-wheel-drive, those numbers will change to 41.5mpg and 155g/km. The bigger 1.2-litre TCe 125 petrol engine benefits from turbochargers and can return as much as 46.3mpg if you stick to the two-wheel-drive variant. It’s impossible to argue with what you get for less than £10,000 here – especially its stylish, aggressive looks. It’s not much fun but it’s thoroughly satisfying. Everyone has enough room to get comfortable, and storage solutions are good too. Some buyers will put up with it, while others might want a bit more. It only scored 3/5 for its crash test performance. Rivals, meanwhile, are scoring 5/5. Let’s see how the car fares against its rivals in the comparison section of our 2018 Dacia Duster Estate review. The new Ford Kuga Estate costs a lot more to buy than the Dacia, but it still offers plenty of value for money and comes really well equipped. On the road, the Kuga was for a long time the best car to drive in this class. That’s no longer quite the case. It still offers an involving and rewarding driving experience, but its rivals have caught it up. Moreover, Ford have watered down its driving dynamics so that it feels more grown up. 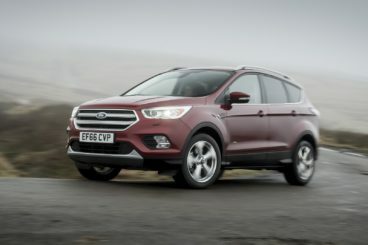 Indeed, Ford have tweaked things so that it’s more comfortable than agile, but buyers shouldn’t be too concerned as it’s still one of the best cars to drive in this class. Body lean is well-resisted in bends, and electric power steering is standard. In terms of its engines, a two-wheel-drive 1.5-litre EcoBoost petrol starts us off. It develops 118bhp, has a 0-62 time of 12.5 seconds and feels at home in the towns and cities. Out on the motorway, however, the 148bhp variant is more capable. It has a 0-62 time of 9.8 seconds and makes for a decent cruiser. Rounding off the range is the four-wheel-drive 180bhp variant. We would overlook this one as its extra grip doesn’t boost performance, while its automatic gearbox hinders performance and bumps up its running costs. That said, the petrol range, on the whole, is more efficient than last time. The 118bhp and 148bhp variants are both good for returns of 44.8mpg, while the 180bhp (which is the only model in the range that can be specified with four-wheel-drive) is good for returns of just over 36mpg at best. Inside, there are things to like about the Kuga’s cabin, as well as things that let it down. For example, it’s stylish, comfortable and fairly well insulated (until you arrive on the motorway at least). However, its design looks dated next to rivals, while the overall quality doesn’t seem befitting of such an expensive car. Moreover, the dashboard is stuffed with buttons and things can get confusing. Is the Ford Kuga Estate practical? It’s longer than last time and there’s enough room for anyone who sits inside here to make themselves at home. There are cars in this class that offer more legroom, but there really isn’t much to complain about on this front. There are lots of storage spaces, including a massive glovebox, while the boot measures 456-litres and can be expanded to 1,603 when you fold the rear seats. The new Renault Captur Estate was recently given a makeover; it now looks sharper and feels more comfortable. Despite being larger than the Clio, the Captur feels a lot like its sibling out on the road. Its light steering means that it’s well suited to towns and cities, but the lack of feel means that body lean is excessive out in the country. The Captur is a great relaxed cruiser, but there isn’t much fun to be had. Ride quality is good on the whole, but bigger potholes will present a problem. In terms of its engines, the 1.2-litre TCe petrol unit is the fastest in the range with a 0-62 time of 10.6 seconds. You get to choose between a manual or an automatic gearbox, but many buyers will find themselves frustrated by how slow the latter is to respond. The 1.2-litre TCe petrol might be the quickest, but we think the 0.9-litre TCe petrol is the best all-rounder. It’s got turbochargers, and while it’s a small and relatively low-powered engine, it’s got lots of punch and can cover the 0-62 dash in 13.2 seconds. That doesn’t seem like a lot on paper, but the Captur feels faster than those numbers suggest. Moreover, because the Captur is such a compact “large car”, we think this engine suits it well. Running costs? The 1.2-litre petrol engine is the thirstiest but it can still return an impressive 51.4mpg economy, while the smaller 0.9-litre engine is good for 55.4mpg. Inside, the most noticeable thing about the Captur once you’re on the move is how comfortable it is. Other than that, there’s not much to complain about for a car at this price point. 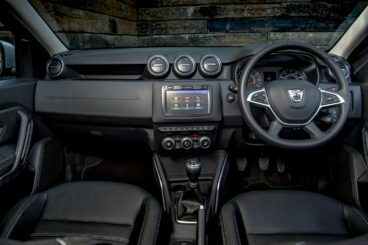 It boasts more soft-touch materials than the Duster, all models come with a height-adjustable driver’s seat, and there is scope for personalisation. 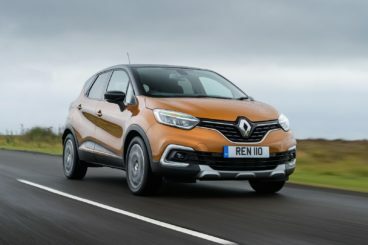 Is the Renault Captur Estate practical? Cars like this live and die by their practicality, and being based on the smaller Clio hasn’t helped its cause. However, there are plenty of pros. It’s bigger inside than the Clio and comes with rear seats that slide back and forwards, while its vertical tail and short bonnet make it easy to park. Sadly, it misses out on the 11-litre glovebox that European models get. Its boot, meanwhile, measures almost 380-litres, which is significantly smaller than the Duster. The Duster is a seriously accomplished Estate car, even if its lowly price tag and basic interior mean that – for some buyers – it will never feel like the real thing. It’s costly to run and there are question marks over its safety, but it’s all about priorities. If you need a strong, practical, spacious and hassle-free car to get you from A to B, the budget-friendly Dacia Duster Estate could be the most value for money thing you’ll ever buy.